Nothing gets my heart racing at a yard sale or thrift store more than spotting a pretty vintage tablecloth lying there for the picking! I have a decent collection and I use them everyday. Sometimes if they have too many holes or stains I will cut them up and make something pretty out of the usable parts. My dear friend Susan, from Fair Haven, NJ had the most divine shop there called Black Eyed Susans. It was filled to the brim with the coolest stuff, vintage cookbooks, vintage tablecloths, her impeccable collection of hammered aluminum, painted signs. Tons of goodies from the past and a wonderful selection of handcrafted goodies, including my own and my BFF Beth’s totes. Susan’s daughter is getting married this fall and she is letting go of her own personal collection of vintage tablecloths. The money she raises will go towards making her daughter’s day a very special one indeed. Susan’s sacrifice is our gain, check out her auctions on eBay here. 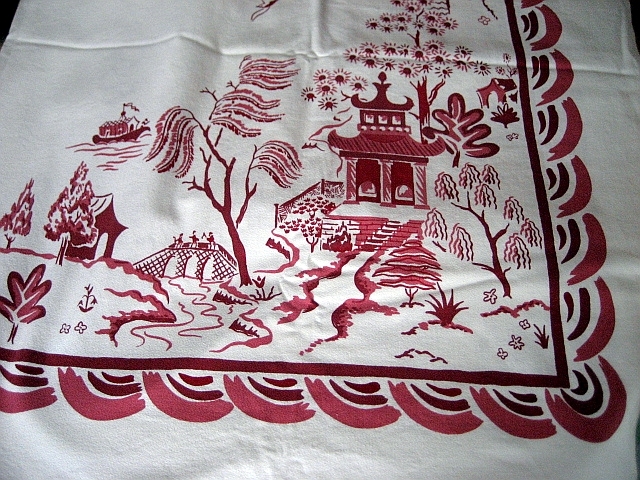 I bought this stunning barkcloth tablecloth from Susan’s store. This is another of my favs, love these colors! I am simply swooning over that last tablecloth – the colors are fantastic! 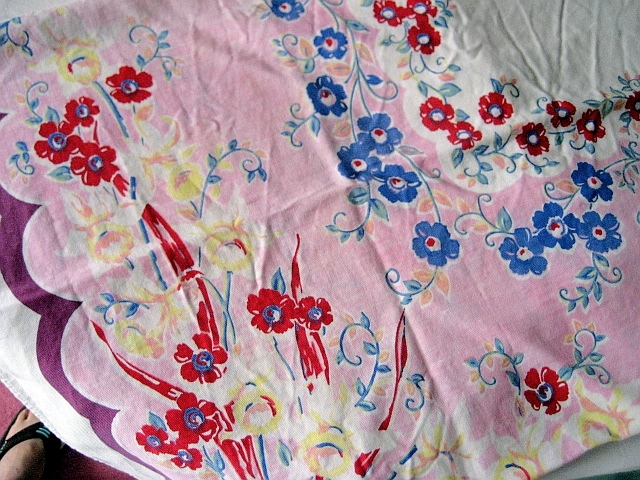 I have a passion for vintage tablecloths, as well…love the cheerful florals. I’ll definitely check out Susan’s auctions. What a wonderful way to fund a wedding! Susan’s collection is really commendable.She made awesome table clothes .All are looks so different and beautiful.